You see, I’ve always been fascinated by how seemingly very small changes in cocktails can make very big differences. I also was, to be honest, fairly embarrassed to find out at close to the last minute last week that the Clover Club recipes I got from two bonafide cocktail book classics, Harry Craddock’s prohibition era Savoy Cocktail Book and Robert Hess’s vastly more recent The Essential Cocktail Guide, could be seen as minority takes on the drink. 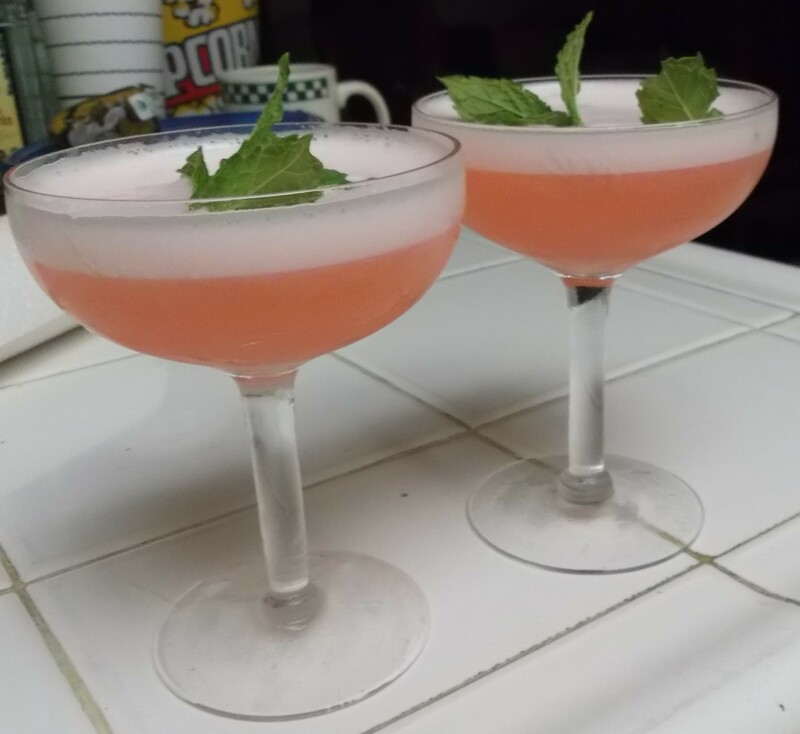 It turned out that most of the presumably classic recipes I found online, such as the one featured on Wikipedia, suggested rather strongly that raspberry syrup, not grenadine, was the default sweetener/pinker-upper for this refreshing, too little known cocktail treat. 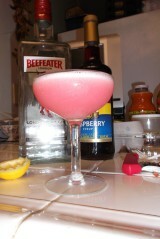 I basically had to try this version out, and so we have today’s pinker, tangier take on the Clover Club. What’s the difference between a little grenadine or a little raspberry syrup? I’ll tell you on the flip side. Once again, we combine all the ingredients in a cocktail shaker, sans ice. Once again, we shake the luke-cool concoction to properly emulsify the egg. Once that’s done, we add some ice and shake again, very vigorously, to add much needed ice water to the mix. Then, it’s naturally time to strain the drink into a chilled cocktail glass. Our toast? How about to second (and third) chances? So, which is better, the grenadine or the raspberry syrup iteration? If I had to choose, I think I’d go with last week’s grenadine. This raspberry adds a delightful tang I really enjoyed, but it was less sturdy in the sense it doesn’t really stand up to as much variation. Last week, I found my favorite version employed 3/4 of an ounce of lime juice although (a bit less) lemon juice was just fine. This time around, I’m counseling readers to skip the lime completely. For me at least, it just didn’t work. Lime juice has some additional flavors that just don’t blend with the raspberry. My favorite version of this drink, however, did use the entire 3/4 ounce of lemon juice, which I suppose is odd given my tart-phobia. I’m guessing there’s something about the dryness of the lemon juice blending with the tangier raspberry-derived flavor. Ultimately, it’s a mystery. And, speaking of mysteries, yes, will be trying another ever-so-slight variation of this week’s beverage next week. Next time around, we introduce something entirely new…a garnish! Stay tuned. Sometimes the difference between one drink and another is miniscule. Take a Martini and put a cocktail onion in it instead of an olive or a lemon twist and it is miraculously transformed into a Gibson. 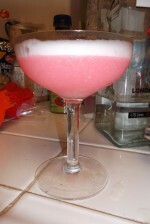 On the other hand, recipes for the same basic cocktail can have vary so dramatically that you wonder how the results can even be compared, much less go under the same name. That’s what I’m realizing right now as I’ve been spending the week trying variations on a recipe I first found in Robert Hess’s 2008 The Essential Cocktail Guide and then found in Harry Craddock’s 1930 The Savoy Cocktail Book. Things got interesting when, too late for today’s post, I turned to my old pal Google and found that there is another version of today’s drink that might be a completely different taste experience entirely because of a difference in one key ingredient. I can’t dismiss it either because all signs point to it being every bit as much a classic, whatever that may mean, as today’s recipe. So, I guess we’ll have to revisit today’s drink again next week, except it won’t really be the same drink. Work, work, work. In the meantime, here is my take on a drink which apparently goes back to a club for gentlemen — presumably no ladies allowed — in pre-Prohibition Philadelphia. As far as I’m concerned it’s a crime to deprive either gender of this liquid delight. Combine all the ingredients in a cocktail shaker and shake without ice to properly emulsify the egg white. Then add ice and shake again to properly chill the concoction. Strain into a frosty-cold cocktail glass and toast the endless wonder and complexity of life and cocktails. The Craddock recipe calls for the juice of 1/2 lemon or an entire lime — and goodness knows why bartenders in the day thought that was an acceptable instruction given the obvious reality that lemons and limes don’t all yield the exact same amount of juice. The vastly more recent Hess recipe calls for simply 3/4 of an ounce of lemon juice, but that came out a lot more tart than I like. It was time to play around with the proportions. While using a mere 1/4 ounce lemon juice yielded too simple a drink, I found that 1/2 an ounce was darn nice. On the other hand, a full 3/4 ounce of less aggressively tart lime juice was the nicest of all. I could have gone for a slightly sweeter drink, but I found that cutting the lime juice down to 1/2 an ounce only resulted in a less lively beverage. At least that’s what I thought. I certainly would never discourage anyone from adjusting the lemon or lime juice upwards or downwards to their taste. I will say, however, that you have to use some lemon or lime juice because, if you don’t, you’ll have a Pink Lady on your hands. I’m saving that one for some time when out of citrus completely.